My Occasional Blog: What's Ngiew? 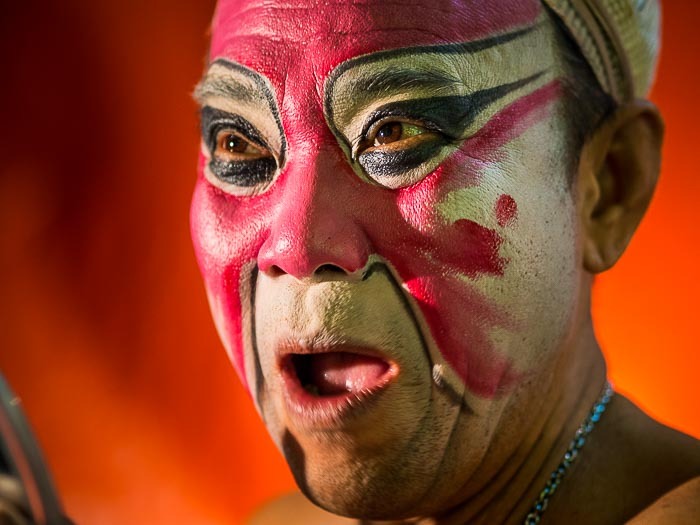 A Chinese opera (called "ngiew" in Thailand) performer backstage at an opera in Talat Noi. I've photographed a lot of Chinese opera this year, maybe five or six. I like going to the opera. I don't understand a word of it. But since they're performed in either the Teochow or Hainese languages, neither do most of the Thais in the audience. There's no denying the spectacle though and they're a lot of fun. Chinese opera in Talat Noi. Sometimes I set out to photograph an opera, other times I've just stumbled into them. Inevitably though performers welcome me into their world for the evening. My practice is to get to the opera very early, usually around 5PM. Most operas start between 7PM and 8PM so that gives me a couple of hours to photograph performers putting on their makeup and getting into character. It also lets me track down whoever is in charge of the opera and introduce myself and ask permission to hang out with them. Backstage at the opera. I was drawn to the crew member's "Ramones" tee shirt. I thought it illustrates how connected the world is. Being an opera performer is not easy. 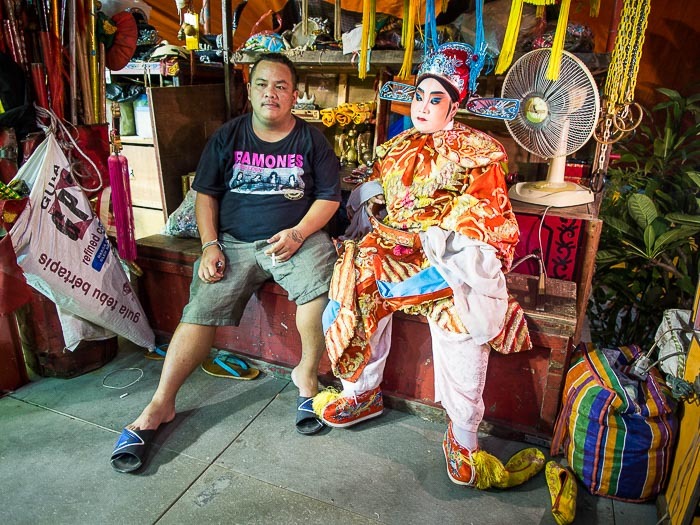 They travel from Chinese shrine to Chinese shrine performing for a few dollars per night. They perform standard operas, some more than 100 years old, and they perform in Chinese languages. Specifically what language depends on the troupe and opera. 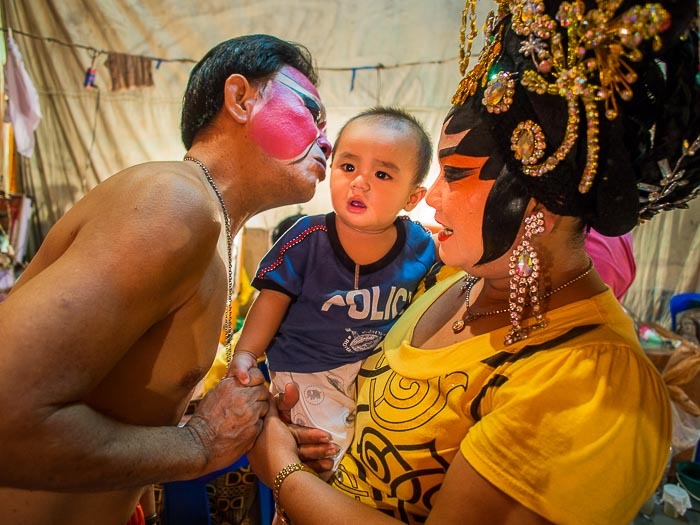 The performers are almost all Thai, many from Isan or northern Thailand. They don't speak Teachow or Hainese. They learn their parts phonetically. A family backstage with their child. 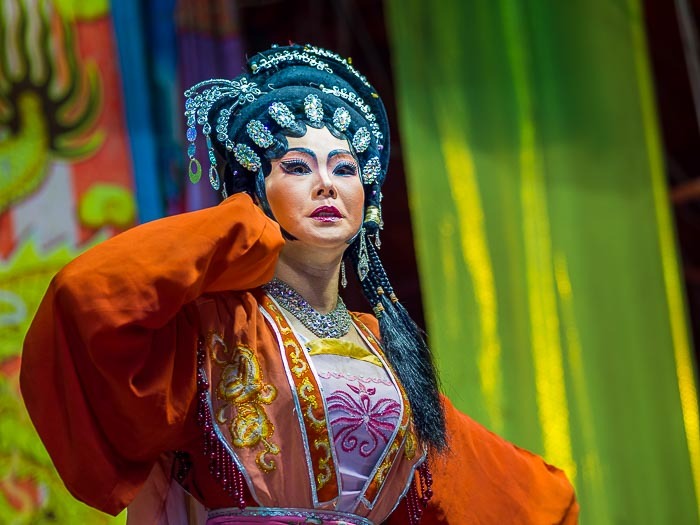 Experts say Chinese opera is a dying art. I don't know if that's true. I do know that I've photographed operas where there wasn't one person in the audience. No one. The chairs were completely empty. But the show must go on. I always find it a little sad when there's no audience at an opera, but the performers seem used to it. Besides, opera isn't performed for an audience in the mortal world. Chinese opera is performed for the Gods, which is why it's usually performed at temples or shrines. Patrons at the temple pay the opera troupe as a way of making merit. If an audience in the mortal, physical, world is also entertained that's just a bonus for the performers. There are more photos from the Talat Noi opera (and other Chinese operas I've photographed) in my archive.